South Korean President Moon Jae-in welcomed the outcome of the recent US-North Korea summit Thursday, calling it a great success that moved the entire world away from the possibility of a war. 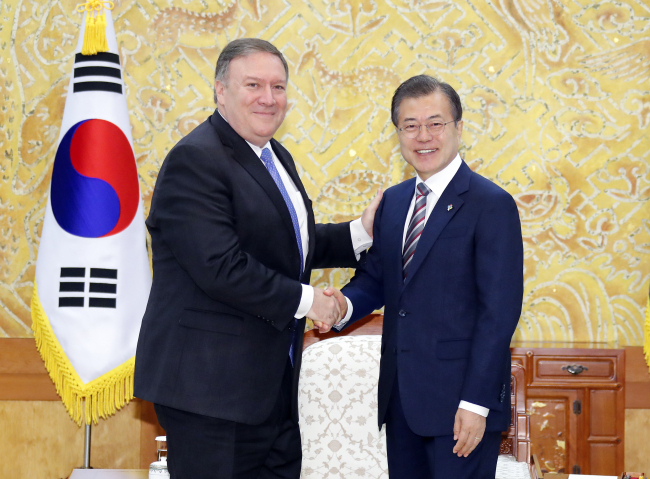 "There are many different views on the outcome of that summit, but what is most important is the fact that it has allowed the entire world, including American, Japanese and Chinese people, to escape from threats of a nuclear war and long-range missiles," Moon said while meeting with US Secretary of State Mike Pompeo at his office Cheong Wa Dae in Seoul. "I believe this alone was a very meaningful development," the president added, according to Cheong Wa Dae pool reports. Moon was apparently referring to the controversy over the possible suspension of joint military exercises of South Korean and US troops here. Following his historic summit with North Korean leader Kim Jong-un in Singapore on Tuesday, US President Donald Trump said he will stop what he called "expensive" and "provocative" war games with South Korea as long as the countries are in negotiations for the denuclearization of the Korean Peninsula. Cheong Wa Dae has said it was still not clear what Trump meant by "war games" but noted the possibility of suspending the US-South Korea joint military drills. "We believe there is a need to consider various ways to further promote dialogue as long as serious discussions are being held between the United States and North Korea for the denuclearization of the Korean Peninsula and the establishment of peace," Cheong Wa Dae spokesman Kim Eui-kyeom said earlier. Seoul and Washington have long insisted their joint military drills are strictly defensive in nature. Many South Korean and US supporters of the South Korea-US alliance have expressed concerns over a possible suspension of their joint military drills, calling them a key deterrence against North Korean aggression. Moon said such concerns or views failed to reflect those of a great many, according to Cheong Wa Dae spokesman Kim Eui-kyeom. "Noting that the South Korean people are the ones who will suffer the greatest damage when or if North Korea uses its nukes and missiles, President Moon said the same South Korean people actively supported the outcome of the North Korea-US summit," Kim told a press briefing. The president was also quoted as saying that poor evaluation of the outcome of the Trump-Kim summit by some experts is "far away" from an apparently positive evaluation by most of his people. Pompeo asked the South Korean president to play a leading role in the process of denuclearizing North Korea by his close personal relationship with the North Korean leader, according to the Cheong Wa Dae spokesman. Moon and Kim have held bilateral summits on April 27 and May 26, while they are also set to meet again in Pyongyang before the end of the year. Pompeo said there remained many tasks to be discussed and done but insisted the ongoing US efforts to rid the North of its nuclear weapons and long-range missiles will prove to be successful and eventually bring peace to the Korean Peninsula, according to the pool reports. The top US diplomat arrived here Wednesday to directly explain the outcome of the historic US-North Korea summit to his South Korean counterparts.